Dress up or complete any outfit with style and flair with a choice from our beautiful jewellery selection. From necklaces to earrings, and bracelets to rings; whether you are a little bit trendy or more classically styled you are sure to find something. We also have jewellery for the young girls and even watches for the men! A beautiful collection of leather bracelets with interchangeable sentiments. Finally, a statement piece that is as versatile as you are. Lenny & Eva Jewelry gives you the freedom to choose! Each piece is handmade from the finest leather, antiqued metals and beads. Choose your bracelet and combine with your favorite sentiment and charms to create a look that is all your own. Wrap your wrist with a positive meaning. 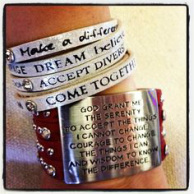 Uplifting messages complement a fashion forward leather bracelet styled with a cool finish, metal plate, or rhinestones. Some of the styles we carry are they original wrap around style a one size fits all metal buckle or in the newer come together styles with metal clasp. Committed to giving back and displaying a chic look, Good Work(s) Make A Difference donates 25% of earnings from each bracelet to charitable organizations. To learn more about Goodworks visit their Facebook page.